Kivumbi Famous Podcast On Uganda-so Passionate & Moving! You just need to listen to this, Kivumbi Earnest Benjamin Famous Podcast on Uganda-So Passionate & Moving! A scripture from the Book of Isasiah18talking about Uganda and Uganda’s role in the eyes of the International Community and her position on the African Continent.www.ekbenjamin.webs.com The date of recording is 10th January 2016. God Doesn’t Only Love Uganda, But Has Called this Nation. 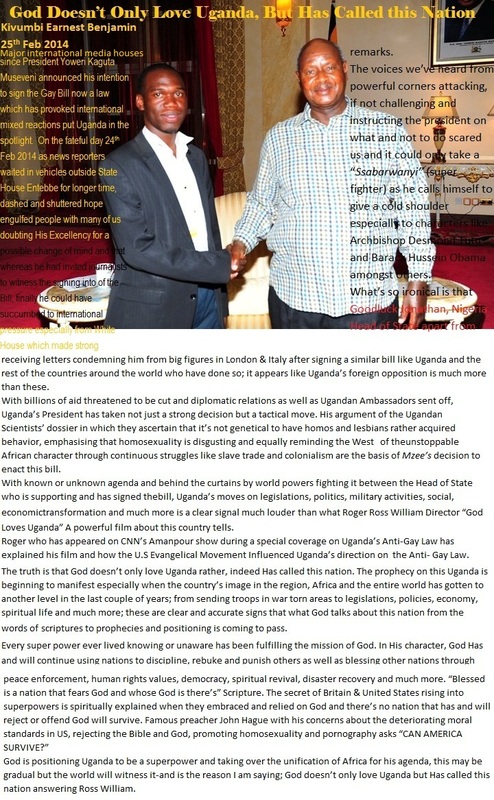 Major international media houses since President Yoweri Kaguta Museveni announced his intention to sign the Gay Bill now a law which has provoked international mixed reactions put Uganda in the spotlight. 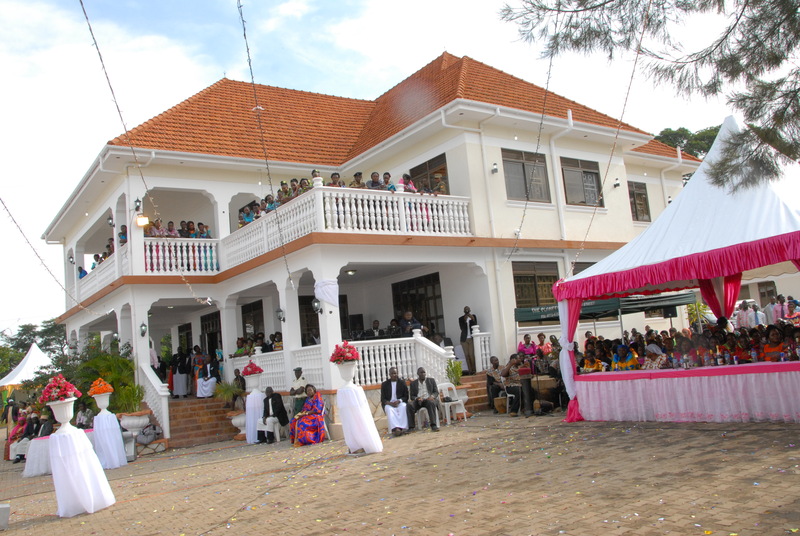 On the fateful day 24th Feb 2014 as news reporters waited in vehicles outside State House Entebbe for longer time, dashed and shuttered hope engulfed people with many of us doubting His Excellency for a possible change of mind and that whereas he had invited journalists to witness the signing into of the Bill, finally he could have succumbed to international pressure especially from White House which made strong remarks. The voices we’ve heard from powerful cornersattacking, if not challenging and instructing the president on what and not to do scared us and it could only take a “Ssabarwanyi” (super fighter) as he calls himself to give a cold shoulder especially to characters like Archbishop Desmond Tutu and Barack Hussein Obama amongst others. What’s so ironical is that Good luck Jonathan, Nigeria Head of State apart from receiving letters condemning him from big figures in London & Italy after signing a similar bill like Uganda and the rest of the countries around the world who have done so; it appears like Uganda’s foreign opposition is much more than these. With billions of aid threatened to be cut and diplomatic relations as well as Ugandan Ambassadors sent off, Uganda’s President has taken not just a strong decision but a tactical move. His argument of the Ugandan Scientists’ dossier in which they ascertain that it’s not genetical to have homos and lesbians rather acquired behavior, emphasising that homosexuality is disgusting and equally reminding the West of the unstoppable African character through continuous struggles like slave trade and colonialism are the basis of Mzee’s decision to enact this bill. With known or unknown agenda and behind the curtains by world powers fighting it between the Head of State who is supporting and has signed the bill, Uganda’s moves on legislations, politics, military activities, social, economic transformation and much more is a clear signal much louder than what Roger Ross William Director “God Loves Uganda” A powerful film about this country tells. Roger who has appeared on CNN’s Amanpour show during a special coverage on Uganda’s Anti-Gay Law has explained his film and how the U.S Evangelical Movement Influenced Uganda’s direction on the Anti- Gay Law. The truth is that God doesn’t only love Uganda rather, indeed Has called this nation. The prophecy on this Uganda is beginning to manifest especially when the country’s image in the region, Africa and the entire world has gotten to another level in the last couple of years; from sending troops in war torn areas to legislations, policies, economy, spiritual life and much more; these are clear and accurate signs that what God talks about this nation from the words of scriptures to prophecies and positioning is coming to pass. God is positioning Uganda to be a superpower and taking over the unification of Africa for his agenda, this may be gradual but the world will witness it-and is the reason I am saying; God doesn’t only love Uganda but Has called this nation answering Ross William.